Kitab Alfiyah of Muhammad bin Abdillah bin Malik al-Andalusi or known as Ibnu Malik is famous for resource of Arabic grammar. It is uncommon to find discourse of the kitab apart from the Arabic grammar. It is the fact that moral values are the other side of its contents, implicitly live in the stanzas. Philosophical worldview makes possible to uncover the moral values, then to interpret it, and to internalize it throung learning activities. 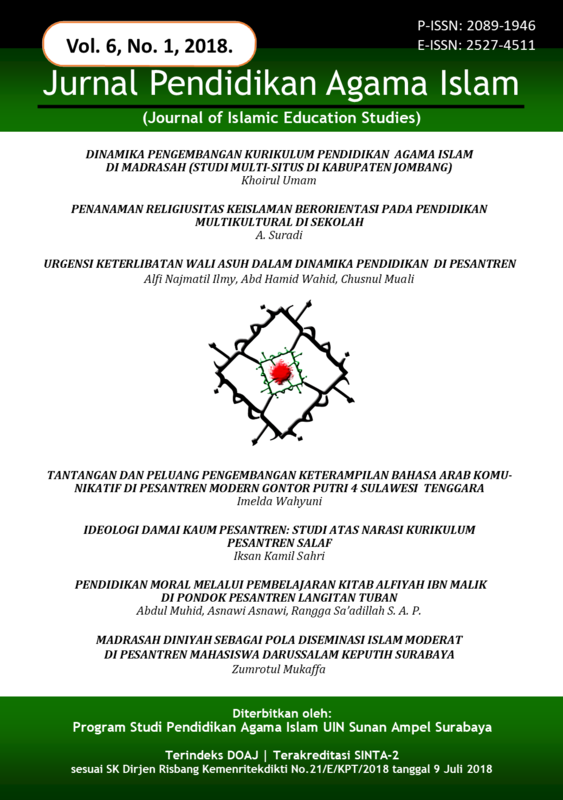 This article describes the moral contents, internalization methods, and reflection of the internalization towards santri in Pondok Pesantren Langitan Tuban. With naturalistic paradigm, data were collected through interview, observation, and documentation. Findings shows that moral internalization in the kitab Alfiyah Ibn Malik learning activities was going through modelling, rewards, punishment, building habits, and indoctrination. In addition, author finds 31 moral values within stanzas in the kitab and 12 reflective behaviors by santri.